Crossing the Pacific Ocean from La Paz, Mexico to Nuku Hiva, Marquesas, then exploring the islands of the South Pacific. To follow our progress, click on the small map on the right side of our blog labeled "Current Position". Our lat/long is plotted at each update. This was it: the trip for which we'd prepared and dreamed for many years. Wings spent the winter "on the hard" in La Paz, Mexico. Bill flew to La Paz in early February, 2013 to splash the boat, install a desalinator and new roller furler, as well as supervise some other important repairs, then returned to Alaska. In early March, Conni and Bill returned to the boat to prepare her for The Crossing. Arriving a bit later was our crewmember for the Pacific crossing, Chip Derrick. In mid-December, 2012, we officially registered for the 2013 Pacific Puddle Jump fleet. The Puddle Jump is a VERY loose confederation of vessels leaving the Western Hemisphere and heading to the South Pacific. While we never saw another sail, they knew that we were out there and there was daily SSB (single sideband/Ham) radio communications for weather and health. Joining the Puddle Jump was the safest way of making the crossing. Since the trip covered such a distance, the route, necessarily, is a Great Circle route of 2710 nautical miles of open ocean. We crossed the equator and the Intertropical Convergence Zone (ITCZ). 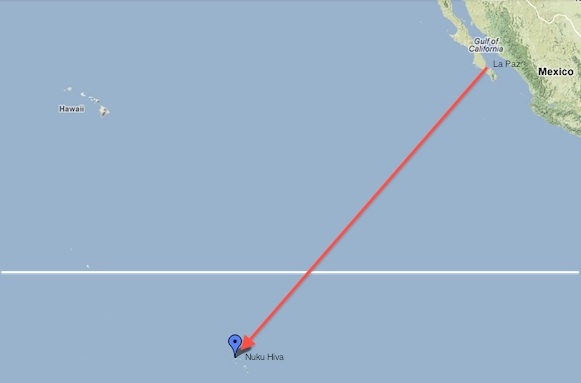 In this graphic, the horizontal line is the equator, while the landmark balloon is Nuku Hiva, an island in the Marquesas, and the arrow begins in La Paz. Of course, we didn't travel in such a straight path! As do most sailing vessels, we crossed the Equator at right angles to reduce the distance to a minumum. In ideal conditions of 120 nm per 24-hr day (horseback speed), the very fastest that we could have traveled the distance is 18 days, but we expected it to be more like 30 days. Our greatest 24-hr sailing distance was 144 nm. The Marquesas are located at 9° 00S, 139° 30W. The presence of our crewmate, Chip, allowed us shorter night watches and enormous advantages in strength and ability. If one crewmate was unable to participate, we still have enough crew to continue the trip and handle difficult situations. Chip left us in Tahiti and we continued on to Raiatea to put Wings to bed. From the Marquesas to Tahiti was another 758 nm. Our first landfall was Nuku Hiva in the Marquesas, part of French Polynesia. As our plans solidified, we decided to leave for the crossing from Cabo San Lucas on the Baja peninsula. We had planned to cruise across the Sea of Cortez to participate in the various activities for the Puddle Jumpers, but work in La Paz caused us to miss them all. Wings will spend her first waiting period on the island of Raiatea, FP. Arrangements were made and we left her in late May. We'll return in very early Spring 2014.